Just under 6% away from it’s All-Time-Highs, showing tremendous price action in calendar year 2018, and consistently improving quarterly earnings results have all combined with recent HOLLY alerts to make NCLH a stock we can no longer ignore. The potential for a long-term breakout is simply too enticing to overlook at this point. 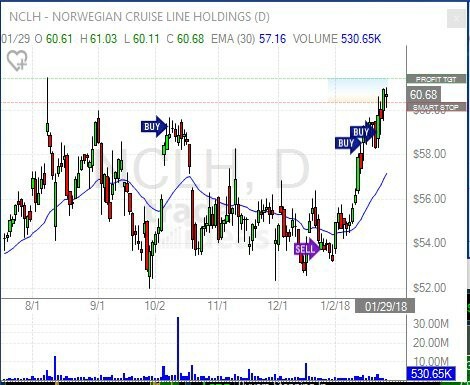 If the stock breaks resistance set back in early Aug around $61.50, then the stage is set for a test of all-time highs around $64.25 and from there, Norwegian stockholders will experience what thousands of it’s satisfied customers see on a daily basis: A wide open blue ocean of possibility. As always, we will begin tracking the performance of this stock from tomorrow’s opening print (Tuesday, January 30, 2018), and we’ll hold this position in the model HOLLY Hot List portfolio until such time we experience a 20% pullback from the high print we see during our holding period. Obviously, the screaming acceleration of this current bull market has been a tremendous wind in our sails, helping to drive gains in many of our existing positions. While it’s tempting to try to pick a top and trim some gains, you’ll never have a monster winner if you’re too quick to take profits in a runaway bull market. As such, we’ll continue holding all these positions until we can objectively say the trend has changed. And our 20% stop loss from the high tick in each position will do the trick. Sit on your hands! If you’d like to learn how HOLLY, the Artificially Intelligent Virtual Analyst, can improve your results, please visit Trade Ideas.